"Just hours after the New Mombasa Slipspace event, the streets of Mombasa lie in ruin." 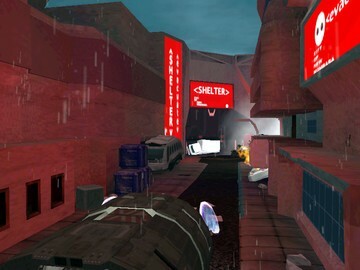 Domain is based on Turf about 4-5 hours after Regret's jump at the end of Halo 2's "Metropolis" level. The sun has set, and rain falls from the sky. Debris from the jump litters the streets. Malfunctioning signs are found here and there. While this map is near-identical to Turf layout-wise, aesthetically, it is slightly different. Now there is debris everywhere, with burning cars and overturned crates. The Warthog is now tipped over and needs to be flipped. The Wraith it had destroyed just before the Slipspace jump is destroyed and is not drivable. Although it IS NEARLY identical, there are some modifications. 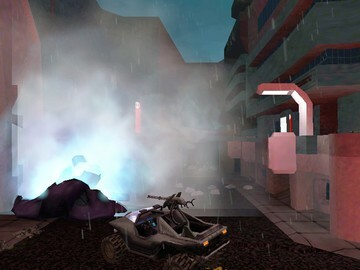 For one, there are now several office buildings which are able to be explored, most notably near the ODST pod, where a damaged air lift in a heating vent leads to a Flamethrower, and near the burning Wraith, where either Active Camo or an Overshield sits near a bank of decimated computer systems. Another change is the placement of Flags for CTF. The bases for CTF are completely reworked to promote better gameplay, and to get rid of the advantage formerly held by the Blue team. While this map supports all gametypes, in testing we discovered that King of the Hill and Oddball are especially fun to play on this map.